“The past year has been a challenging time for us… we are ever grateful for everyone’s feedback, support & encouragement. To the team who work so hard with us – sincere thanks and gratitude for being part of our family. And to all, we remain humbly, your Truly Singaporean eatery and we look forward to serving up ‘shiok’ makan for a long time to come. We have been informed this morning that New Ubin Seafood has received a Bib Gourmand in the inaugural Michelin Guide Singapore 2016. It is an honour that a simple cze char place like us can be awarded with such an accolade. We share this privilege with all of our customers, team members and partners who have supported us through the years – we couldn’t have done this without you! Please be assured that we will continue to work hard, to ensure that everything remains true to our simple mission of serving shiok food and endeavouring that you have an enjoyable time in our humble abode. Once again, thank you all for being a part of this Singaporean family’s makan journey. 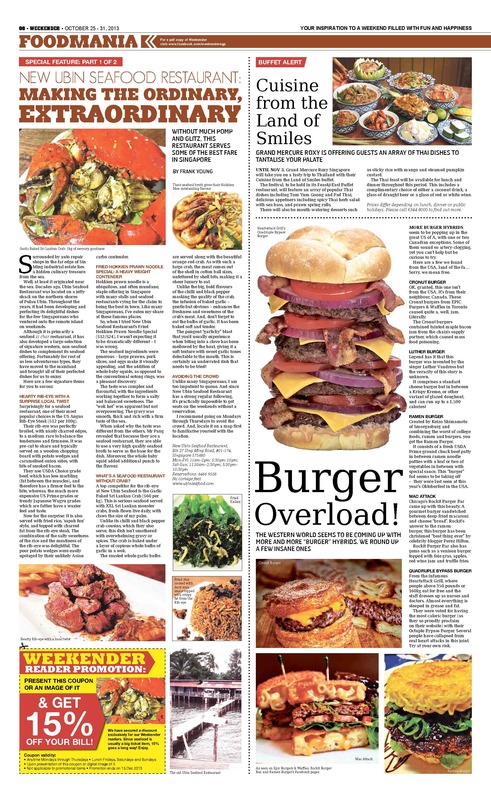 Presenting our feature on Meat & Greed, which was featured on Channel 5 in June 2012 ! We are pleased to inform you that both the English & Mandarin versions of the video are available below. Click here to make a reservation now! Hear what other people have been saying about us! 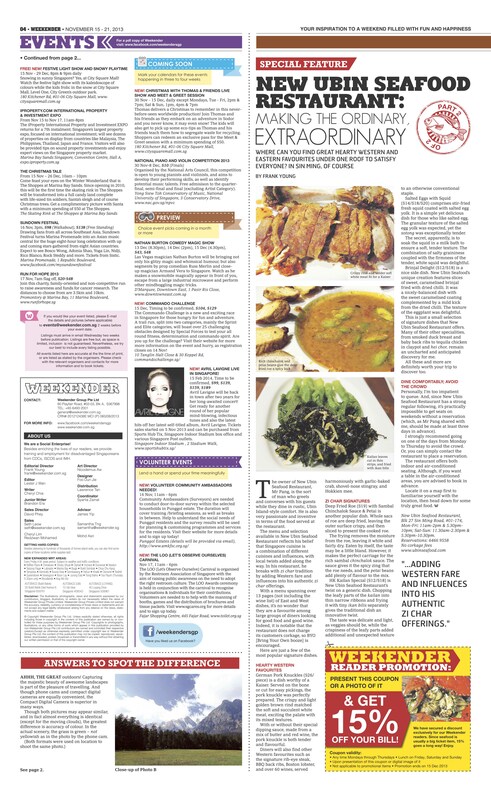 2nd Review in the Weekender – 15 November 2013! As featured in Dr Leslie Tay’s food blog! ” What comes to mind when you mention Pulau Ubin? Probably images of Kampong houses, kids running around in singlets and catching spiders right? I guess that is the kind of image that a restaurant called New Ubin Seafood wants to project in the mind of the potential customer and they have managed to do it to a certain extent. When you step inside this rustic little restaurant inconspicuously hidden amongst the motor mechanic workshops in Sin Ming, you might momentarily imagine that you are in a little Kampong hut in Pulau Ubin! And, just as Pulau Ubin had somehow managed to escape the ravages of development, this eponymous little shack of a restaurant seemed that have done the same. In rapidly developing Singapore, shady little shacks like these are hard to come by! Review by Trilife on Trip Advisor! Read the other reviews on Trip Advisor here! “had heard about the increasing popularity and seen on various instagram and facebook feeds quite a bit about this place recently, so decided to drag (okay fine i didn’t have to drag; the fam bam is always willing to hunt down good food teehee) my family there for a meal one sunday evening. we had previously visited this place once, but it was a long time back before it became the popular seafood haunt that it is today. i remember being very young and bewildered that we were having dinner in a coffeeshop-like setup in the middle of a bunch of car workshops! ” I’ve been looking forward to a good zi char meal ever since I came back. I think I’ve had enough of cafe-hopping for the time being- you have no idea how many cafes I dragged the friends into during our winter vacation (Berlin especially hehe). ” Residing in Bishan, Ang Mo Kio or Thomson and looking for an eatery to do ‘BYO wine’ dinners? I recently came to know of New Ubin Seafood which accomodates BYO wines at no corkage charge. Its located at Blk 27, Sin Ming Road, #01-174, Sin Ming Industrial Estate, S(575680) Tel: 64669558; two bus stops away from Marymount MRT station. I had the opportunity to do two ‘BYO wine’ dinner sessions recently at this place. Maurice learnt about its pro-BYO wine policy and was good enough to organize the dinners. ” Opened in !986, Ubin Seafood has expanded their culinary expertise to serve not only fresh seafood and traditional zi char, but also a Singaporean take on American, French, Italian and Indian cuisines. I seriously questioned why there was such a mashup of different styles on offer, but I believe that what matters is the quality of the food. I’m sure they had to be pretty confident that everything on the menu is delicious in order to include it. ” My first time writing about a zichar place but New Ubin has that “hip” quotient befitting of crazyshakes – and so it makes the blog. Most zichar coffee shops cater to families who live in the neighborhood. However here diners were groups of friends all in their 20′s – an obvious sign it is a hit with the younger ones. I mean I travelled about 5 highway exits just to eat here so that says a lot. ” This was a bit of an unusual spot (Block 27 Sin Ming Road, #01-174 Sin Ming Industrial Estate Sector A, tel : +65 6466 9558) for a weekend lunch. For one, I hadn’t known of its existence until quite recently even though I have had ba kut teh just around the corner. The location in the middle of industrial park amidst vehicle workshops wouldn’t quite advertise its presence as well. The next cholesterol bomb was battered and deep fried oysters in salted egg yolk. The flavors of the salted yolk were robust and the oysters were actually pretty fresh tasting. Would make excellent pairing with white rice if I may say so. The last item that was served arrived after we were done with the other dishes. We had been informed earlier at the start that it would take a while. This, was the second part to the shovel nose ray which contains collegen rich gelatinous parts surrounding a proboscis like soft bone structure. Both the outside and the interior were filled with the light gelatinous matter which tasted very much like eating hashima or bone marrow in chicken essence. The last part came from the rich broth that the ray was steamed in which could have been what is normally passed as superior sauce in Chinese restaurants. Now, tucked in the Sin Ming Industrial estate, amongst the car re-spray people, finding a place to park on a weekday lunch can be a challenge. I was told its rather easier to find a lot in the evenings and weekends. Wolfgang Puck can rest safe at night that this does not threaten his Cut for the title of best steak in Singapore…but the Astons of the world should take note. The meat is high quality. Lean, mostly, as the fat has been trimmed (more on this in a moment). The meat was not melt in your mouth tender, it was vigrous and fiesty…giving the teeth a bit of a fight, but the flavour was full, and bursting. Lightly sprinkled before serving with salt and pepper, it was quite satisfying. Review by Jeannie L on Yelp! ” New Ubin Seafood is… not on Pulau Ubin anymore. Despite that, it is still somewhat out of the way in Sin Ming, hidden in an industrial estate behind all the vehicle repair shops. This place serves an eclectic mix of the usual seafood dishes and western-inspired fusion dishes with a twist. The first thing you observe is the USDA Choice Ribeye sitting on everyone’s table. This is the star dish. An interesting take on steak, it is grilled to your specifications, cubed and served on a wooden board. Caramelised onions, fries, mustard and ketchup complete the setup. Accompanying that is an extremely sinful fried rice on the side, containing the trimmed beef fat from the steak. Essentially heart attack on a plate! So bad yet so good. The “wok hei” aroma is apparent, and the rice bursts with fatty smoky flavour, not overly oily or soggy. ” Oh yes, you read it right. This is New Ubin Seafood. But it serves a really good steak! Choice US ribeye steak broiled and served with potato wedges and caramelised onions. And you’ll find this restaurant in the most unlikely of places. It’s in the heart of the Sin Ming Road industrial zone, a neon-lit facade nestled among car and machinery workshops. First-timers may have difficulty locating the place, but the effort is well worth it.